Subscribe to My Paper Pumpkin by Stampin' Up! by Monday, February 10th and get a FREE package of 2012-2014 In Color Markers (a $14.95 value) in your Welcome Kit! 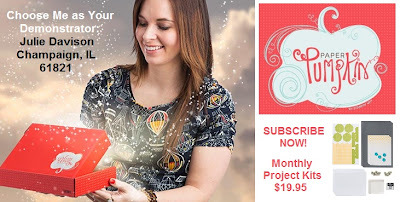 As a My Paper Pumpkin subscriber, you'll enjoy a new project kit delivered directly to your mailbox every month! Each kit is different (cards, a mini scrapbook, home decor), but always includes pre-cut materials, stamp, and ink -- everything you need (except scissors and adhesive) to complete the projects. Your first kit will include a Clear Mount block to use with all of your stamps. The cost is $19.95 per month (+ tax); shipping is free! You can skip a month or suspend your subscription whenever you'd like. There is no obligation to fulfill a minimum number of months. Check out my My Paper Pumpkin Pinterest Board to see samples projects made with past My Paper Pumpkin kits! At Leadership Conference last month, I got a sneak peek of the February and March kits and I am excited to see that these upcoming kits are more substantial than past kits. I think March is my favorite kit yet! And if you subscribe to My Paper Pumpkin NOW, you'll get your Welcome Kit in February and the March Kit in March. 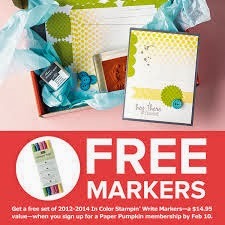 Click here to subscribe now and claim your free markers by Monday, February 10th. 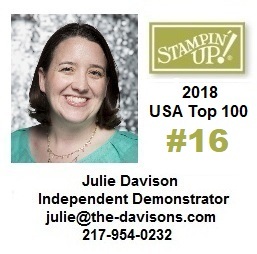 Here's a video from Stampin' Up! that reveals the January My Paper Pumpkin Kit. This wasn't my favorite kit, but I still enjoyed sitting down and playing with it. Sometimes it's nice not to "think" and to sit down with coordinating products and "just stamp". Here are some alternative designs that I created with the January Kit. I still had a leftover card and die cut pieces, plus I only used one out of the package of buttons they included as a free gift in January! Click here to subscribe now to My Paper Pumpkin and claim your free markers by Monday, February 10th.